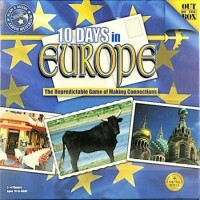 This is an overview of 10 Days in Europe which is part of the "10 Days" travel games series. You have 10 Days in Europe – Chart your course from start to finish using destination and transportation tiles. With a little luck and clever planning, you just might outwit your fellow travelers. 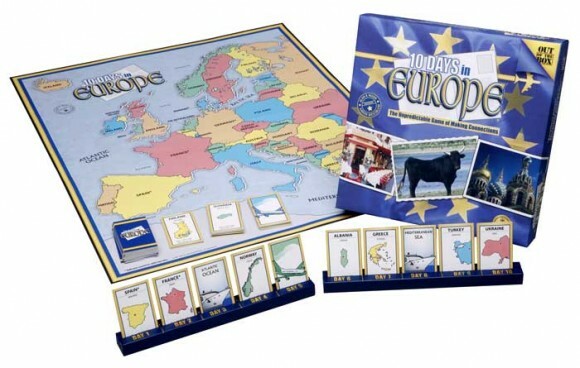 In 10 Days in Europe, players use country and transportation tiles to chart a course across Europe. The first player to complete a ten day journey, where each day connects to the next day, is the winner! The goal of this game is to plan a 10 day trip through Europe. Each of those ten days, you must either be in a country or on a plane or boat, and you cannot be in the same country for multiple consecutive days. To travel to another country, it must either be a) adjacent to the one you are in, b) reachable by boat, or c) be of the same color and thus reachable by plane. However, the boats and planes have some restrictions, too – boats can only travel on the body of water mentioned on them and planes have to be the color of the countries between which you are traveling. The winner is the first person to correctly complete a 10 day trip. The game is very quick to learn (as all Out of the Box games are) and you do not need to have a good grasp of geography to play, but it does help, especially is traveling to adjacent countries or by boat. It is very important to get the best arrangement out of the cards you are dealt because once they are in the holder and game play starts, the only way to move them to a different slot is to discard to one of the three discard piles and hope that another player does not pick it up or cover it before you get a change to reclaim it and place it in a different day. I played this several times over the last weekend. The objective of the game is to connect your travels across countries using adjacent countries, oceans, ships and planes. You have 10 tiles (days), and the winner has to have all of them in a row. You can only substitute from a discard/random pile directly into your trip. No shuffling your trip around. It does require thought and long term planning. You have to watch what is being discarded (and buried), what you need, when to change your trip around because it’s a lost cause, etc. It can be frustrating if you know a tile you need is buried, etc. So, you have to flexible (you don’t want to think “I need this one country to win!” … because you’ll end up sitting there for a long time, hoping, dreaming. We actually played this game “connected” to America once. (I think you can also connect it to an Asia version.) So, that made it even more complicated and interesting. I won once, and lost twice (including a big screw up – loss). A decent game, not terribly exciting; but steady and methodical thinking game. Add a Review for "10 Days in Europe"